Welcome to the 3rd year of the SHARP Program (Students Harnessing Academic Readiness through Performance). SHARP Program is a joint collaboration of the University of Maryland, School of Music, College Park, William Wirt Middle School and ArtSi! Riverdale. The SHARP program has received local and state recognition for its creativity and generosity to young disadvantaged minority students in our region. 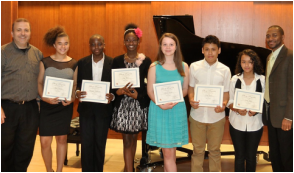 As part of the program, middle school age music students have the opportunity to work in partnership with University of Maryland Music Students in a series of private lessons, group music classes (master classes), and a host of performances, both at William Wirt Middle School in Riverdale Park, MD and at the University. 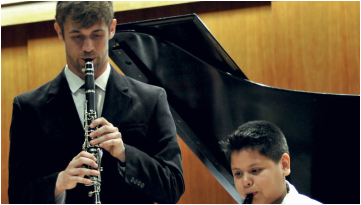 The Program consists of private study for each semester, October through December (Session 1, 10 – 30 minute lessons) and then again February through April (Session 2, 10 – 30 minute lessons). William Wirt Middle School is a great location for the program and is a 5 -10 minute drive from the UMD College Park campus. If you are interested in being part of this volunteer program please email me by September 21, 2016. My email is: rdilutis@umd.edu. Being a volunteer can be a generous and rewarding experience for you and your students as well as great experience for your pedagogy and future teaching.